most comprehensive orthodontic options available. most compehensive orthodontic options available. Vous préférez en français? Cliquez ici. Are you looking for an orthodontist in Oakville? Has your primary dentist recommended an orthodontic exam to determine whether your child might need corrective procedures in the future? Maybe you feel that your bite is off or that the spacing of your teeth is not quite perfect. 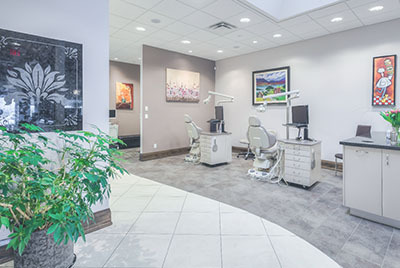 Whether you're interested in discussing future treatments for your child or are unsure of the options available for adult orthodontics, the experienced staff at East Oakville Orthodontics can help. To make it easy for Oakville residents to visit an Orthodontist, we're located at 2501 Prince Michael Dr., Unit #5 in Oakville, Ontario. You can find us in the Shoppes on Dundas plaza, on Dundas Street, between 8th and 9th Lines. There's plenty of parking in front of our office and you'll find a Starbucks and a Shoppers Drug Mart right in the same mall. We are also wheelchair and stroller accessible. Most first-time patients have similar questions. They would like to know about the different orthodontic procedures. They wonder what types of treatments will help in their individual case, and what the cost will be. And almost universally they want to know how orthodontics will fit into their lifestyle and what time commitment will be involved. What will the treatment appliances look like? Will it be difficult to wear braces? Will it cause pain or cause changes in speech? These are all very common questions and we want you to realize that you're absolutely not alone. Dr. Helene Grubisa and the entire team of hygienists and assistants at our clinic are dedicated to the individual, personalized treatment of each patient. We'll take great care and time explaining every option to you. At your consultation with Dr. Grubisa, she'll walk you through every facet of the recommended treatment so that you understand everything about your personal situation. We will explain how treatment will improve your bite, what orthodontic treatment will look like, and how it will impact your social life! We'll talk to you about the basic maintenance concerns and offer an abundance of support so that your questions are answered and concerns are alleviated. You're unique! We offer treatment options. We realize that you'll have questions about orthodontics, so we've put together a great deal of content to help you learn more about our practice and different aspects of orthodontic care. We're always available for a consultation if you have specific questions. If you're currently a patient, please feel free to write down any questions or concerns and bring them to your next appointment or call us for assistance. Becoming a Patient. If you haven't been in to see us before, our Becoming a Patient page can give you all of the information you need to prepare for your first visit. Don't worry; it's not difficult. You’ll be able to get an overview of the process so you can come prepared with any questions you might have about your treatment. Meet Our Team. We're very proud of our dedicated, professional and helpful staff. We are all friendly and gentle! Feel free to browse our Team page to learn more about each team members’ experience and how they’ll take such good care of you. Common Bite Concerns. There are a number of different bite concerns that can cause issues for you functionally, and impact the aesthetics of your smile. We can help you determine which bite you have, so you can learn about the condition and treatment options available to you. Types of Braces. There are a few options for treatment, depending on the age of the patient, type of bite, and crowding of the teeth. If you read our overview of the different types of braces, you’ll be familiar with your options before you have your consultation with Dr. Grubisa. Invisalign®. Many adult patients are very interested in Invisalign® to correct their orthodontic issues. As the name implies, this option is invisible, or nearly so, and it means more comfort and less self-consciousness for many older patients who don't want to wear traditional braces. Orthodontics isn't just part of what we do, it’s ALL we do. You deserve an orthodontist that you can trust to make you feel at home, and formulate the perfect treatment for your needs. Dr. Helene Grubisa offers the highest quality of care for every type of patient. Please start your discovery of our clinic by learning what it’s like to become a patient here or getting familiar with Dr. Grubisa or the EOO Team.